Chinese Capital Controls a Warning for U.S.
With the bombings and their aftermath in France, it’s difficult to find other headlines. Perhaps some people find it insensitive to seek other news in the wake of such a tragedy? I don’t know. For me, I try to find those other stories because events are still unfolding around the world that have the potential to affect me and everyone else profoundly. No truer words have been said about modern times. Governments are collecting metadata on their people, ostensibly for the sake of national security. As currencies begin to move away from hard assets like gold and cash and into a virtual state of ones and zeros, these quotes become all the more poignant. Capital controls are a very REAL thing, and if it hasn’t already it’s coming to a country near you. As countries start to adopt a virtual version of their fiat currencies, controlling the information and controlling the money becomes one and the same. We of course know about Cyprus and Greece, and very recently Sweden. I think people expect it of places like China, however. And because people expect it of them, they often are dismissive of it, believing it would NEVER happen here. For those who either think that way, OR encounter people who think that way, it’s important to look past labels. China is labeled a communist country while the United States is labeled a capitalist one. To accept either at face value is naïve. In many ways, China has behaved far more capitalistically than the United States; likewise, the United States has come awfully close to outdoing China with its oppressive central planning. Economically, China and the United States have a very contentious relationship. China has surpassed the United States in several ways, and is looking to engage her in a competition for reserve currency of the world. For all intents and purposes, China is in the United States economic weight class, and to ignore their policies is to ignore their strategies and weaknesses. The State Administration of Foreign Exchange (a.k.a. SAFE), China’s foreign exchange regulator, has imposed annual limitations on cash withdrawals outside China on China UnionPay bank cards. UnionPay cardholders may withdraw a maximum 50,000 yuan ($7,854) in the last three months of 2015, and a maximum 100,000 yuan in 2016. Because UnionPay processes virtually all card transactions in China, the new limits apply to all Chinese credit and bank cards. Beijing already imposes a 10,000-yuan daily limit on withdrawals. These are recent restrictions from September of this year; a response to the hastened outflow of capital from China. China is in a very delicate situation, and people are getting anxious. The volatile equities markets, while not totally unimportant, isn’t indicative of her real economic woes. That is a problem which is contained within their own monetary policies and a state of deflation. 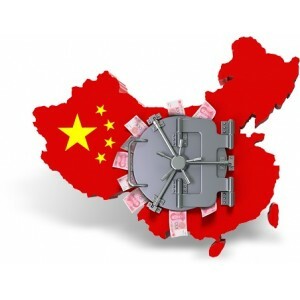 The REAL issue is defending the renminbi itself. If you recall, China decided to devalue its currency back in August. Some hypothesize that this was a sad effort to prop up its equity markets by cheapening the renminbi. Having a sale on yuan was not a good idea when public confidence was already several feet below sea level. It resulted in a panic and accelerated capital flight… which lead to the policies listed above. The estimated rate at which money is leaving China varies depending on who you ask. Bloomberg says about $141.7 billion while Goldman Sachs says it’s closer to $178 billion. China’s response to this? Sell off foreign exchange, namely the USD. They are selling at a rate of $20 billion per day which isn’t sustainable much past a year. This will buy them time to decide: do they employ harsher policies which could exacerbate the current issues by sending public confidence off the deep end entirely; or do they let the capital continue to flow out of their country? It just shut down one of its biggest underground banks, which was responsible for over $64 billion in “illegal” foreign exchange transactions. Evidently there were some gaping loopholes in their regulatory policies which these banks used in order to avoid scrutiny from bureaucratic overseers. Whereas Argentina has the “Blue Dollar”, China has these gangs. You hear the word “gang” and immediately think villain… but in this case, I can’t help but think they are the heroes in this story! What criminal organization ever HELPS people save their money?! Does this sound even a little bit familiar? I’m not talking about the EU and its economic panic… but more regarding the United States. No? Think Bitcoin and the war the US Dept. of Treasury has been waging on it. In Sweden only criminals use hard cash right? In the US, only criminals would use virtual currency like Bitcoin. This is the smear campaign and the groundwork. The US is already getting people worked up over jobs and wealth going overseas. Expect a very similar crackdown in the US. If you can get your money offshore, into hard assets like real estate or metals, you stand a better chance of weathering that inevitable storm, because once harsher capital controls are instituted, it’ll be damn near impossible to get out.